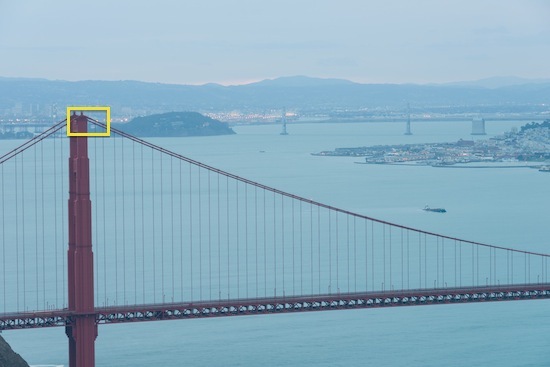 Nikon D800E: Now That’s Resolution! Aside from all the other problems with this image, I thought I saw an artifact as shown below. See that thin line above the diagonal bridge cables? 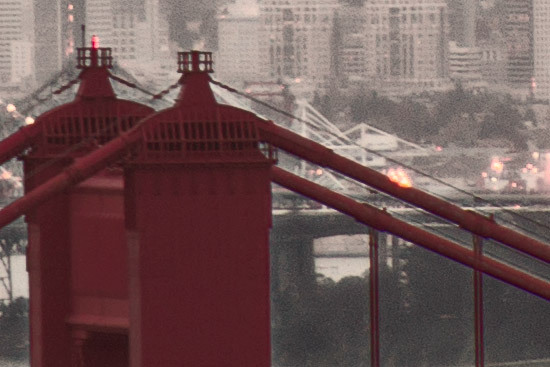 It looked to me like I had some vertical camera shake or something else that caused a slight double exposure. I haven’t been able to reproduce it convincingly here, but trust me — that’s what it looked like. It was a little windy this morning, but I thought I’d used my best techniques: solid tripod, mirror-up mode, remote release, etc. 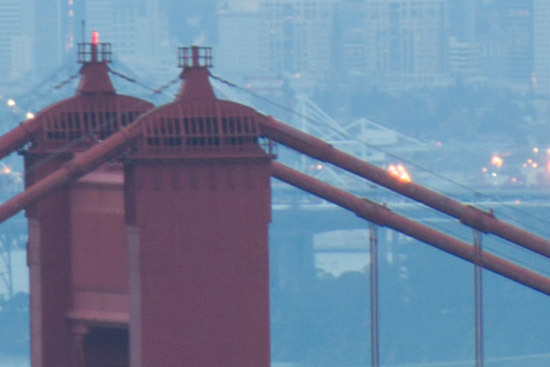 Next I zoomed in to 100% and look what I discovered: There’s a whole additional set of cables or wires draped from the tops of bridge towers that parallel the suspension cables. 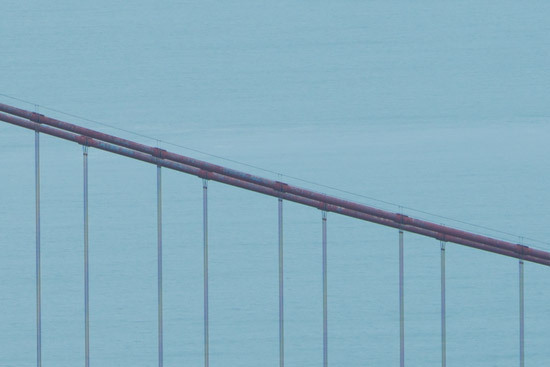 In all the years of shooting the Golden Gate bridge, I’d never noticed them. Below is another version at 100% after some color adjustment and sharpening in Photoshop. The above may not give the impression that I’ve captured much detail until you check the image below. The yellow rectangle shows the area from which the above 100% crop was made. It represents only 0.5% of the full-image pixels. This is the advantage of a 36.3 megapixel sensor. And it would have been even more dramatic if I’d used the sharper 70-200mm f/2.8 lens. Now I just need to go back on a better morning!